Every year, fans flock to Spruce Meadows for the Friday of the ‘Masters’ CSIO5* Tournament and the Mercedes-Benz Evening of the Horse. After a full day of shopping and entertainment including the BMO Nations Cup Team Autograph Session, fans filled the International Ring to enjoy the evening. The evening started with the Tourmaline Cup (1.60m) – one of the last chances for those riders not competing on a Nations Cup team to qualify for Sunday’s Grand Prix. Twenty-seven top international horse/rider combinations started the evening competition with hopes of making it to the winner’s circle. Ten athletes jumped clear first rounds to move onto the jump off. The top three riders placed in this competition qualify for the Grand Prix on Sunday which added that little bit of pressure as the jump off began. The fastest time in the jump off belonged to Eric Lamaze (CAN) and Fine Lady 5, but an unfortunate rail halfway through the jump-off would have them finish fastest of the four faulters. Portugal’s Luciana Diniz has been looking for her first win of the 2018 Spruce Meadows ‘Masters’ and tonight was her night. Her mount Camargo 2 gave it his all as the two galloped through the finish line on a clear ride with a time of 43.96s. The ATCO Six-Bar is always a highlight of the Mercedes-Benz Evening of the Horse. The lights come on, and athletes compete down a line of fences in attempt to leave them all up. Each round, the fences get a little bigger, with the height of the final fence generally reaching well over the standard 1.60m. Twelve horses started the fan favourte competition and the final fence of Round One stood at 1.50m. Only 7 of the starting 12 left all the fences up in Round One to proceed to Round Two where the final fence was to measure 1.85m. This height would knock out another 4 riders leaving only Eduardo Menezes (BRA), Holger Wulschner (GER) and Dermott Lennon (IRL) remaining to move into Round Three. For Round Three the height of the final fence stood 1.90m. Menezes and his Olympic mount Quintol would had the a rail in Round Three, while Wulschner and Lennon jumped clear. Both riders would decide that it was enough for their young horses and they elected to tie for first place. 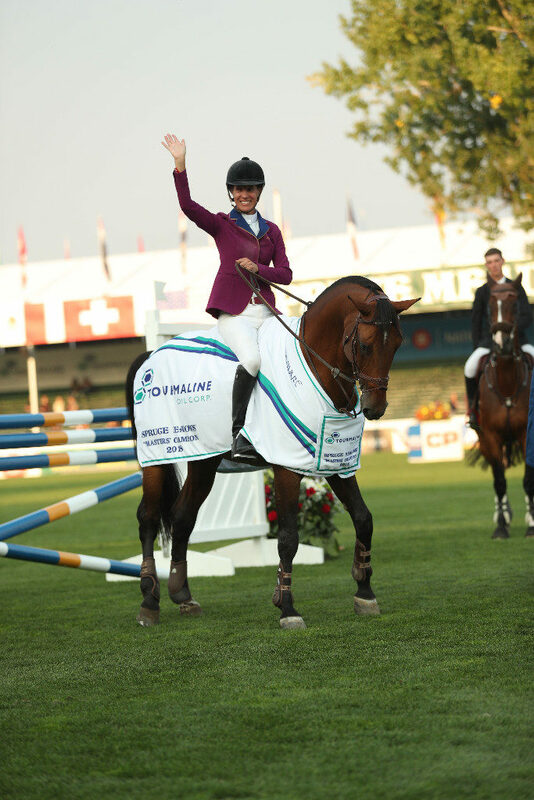 Click here for Full Results from the Spruce Meadows Masters.